Maa Saarala is a Hindu goddess who patronizes the cultures of Vaishnav and Shakta. Rarely does one find the use of Vilva Patra and Tulasi patra in any temple, as they are symbols of two distinct divisions of Hindu culture. Goddess Sarala is known as Vak Devi, the Goddess of Knowledge and Wisdom. It is well documented that Sidheshwar Parida - a small time farmer and part-time Odia Paika - was an ardent follower of the Goddess and it was after her blessings that Sidheshwar Parida became Sarala Das, the author of the Odia Mahabharata. Although there are many festivals that are celebrated in the temple, the major ones are: Parbana, Sharadiya Utsav, Pana Sankranti, Dola Purnima, Chandan Jatra. The people of the Kendrapara, Jagatsinghpur and Cuttack districts are so attached to the goddess that they make it a point to visit the temple every year - at least once. The Sarala Temple is a Hindu temple in the district of Jagatsinghpur, Odisha, India. 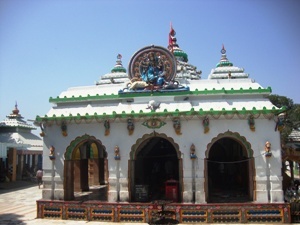 The temple is accessible by road from Jagatsinghpur, Cuttack and Paradeep. The nearest airport is Bhubaneshwar, which is approximately 80 km, and is well connected by road. The nearest railway station is Cuttack; however, there is a small Passenger Halt at Sarala Road, near Tentulipada. The temple can be reached via Jagatsinghpur, or Tarapur by road, from Cuttack.